The euro has arrived. On 1 January 2002, about 300 million European citizens said goodbye to their national banknotes and coins and greeted the euro - the new common currency. The euro is now the only legal currency of 12 European nations: Austria, Belgium, Finland, France, Germany, Greece, Ireland, Italy, Luxembourg, the Netherlands, Portugal and Spain. Businesses, residents and travelers in the euro-zone can now cross borders without changing currency. That means no more foreign exchange costs and no more of the uncertainties linked to an instable exchange rate. Prices will be easier to compare across countries, which is expected to make companies more competitive and deliver stable and in some cases lower prices to consumers. For euro-nations the solo currency also brings obligations. 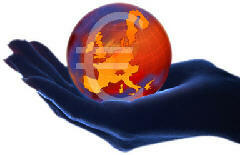 Each nation must keep within the euro-zone economic rules, according to the dictates of the European Commission. In the short-term the adoption of the euro - the world�s greatest currency changeover - appeared to go remarkably smoothly. Consumers seemed keen to make the transition and by the end of the first week of January, 75% of cash transactions in the euro-zone were carried out in the new currency. By the end of February the national currencies of the 12 member-states had been withdrawn and the euro was in sole use. The smooth changeover was largely a result of the massive preparation carried out behind the scenes by the European Central Bank working with the national central banks of the 12 euro-zone countries. In the lead up to the launch nearly 15 billion euro banknotes (worth 633 billion euro) were printed - enough to cover about 15,000 football pitches. Another 52 billion euro coins (worth 15.6 billion euro) were minted. The euros were then distributed by road, rail, air and sea throughout the euro-zone. Security was tight, with police forces, and in several countries the military, involved in the process. Shipments were monitored by satellite. Problems were few. A massive information campaign was carried out to ensure that euro-zone businesses and residents understood and could handle the new currency. The only glitches in the changeover were minor, according to the European Central Bank. They included long queues outside some banks on the first day of the changeover. The media reported on one very long queue outside a Naples bank caused an elderly man who wanted to cash in 67 million lire brought in a biscuit tin. After waiting outside the bank from 5.00 a.m., the old man slowly handed the lire to the bank teller in worn out notes ranging from 1000 to 100,000 lire. There were also some delays in the changeover of automatic tellers from national currency to the euro and some large retailers ran out of some values on the first day. Reports of unjustified price rises continue to appear, but there have also been reports of many supermarkets rounding down prices. The European Central Bank reported that there had been a few attempts to use fake copies of the euro banknotes. All were poorly made - including photocopies of the notes - and most were easily detected. According to one media reports, however, a customer managed to buy a drink in a French bar on New Year�s Day using a five-euro note from a Monopoly set. The owner of the bar said the server who took the fake money was not used to the new euro bank notes and was a little tired after working a late New Year�s Eve. If media coverage is anything to go by, the changeover to the euro is no longer a big issue, although economic commentators suggest that the long-term path may not be as smooth. The Treaty of Rome is signed, establishing the European Economic Community (EEC) and creating the Monetary Committee and the European Investment Bank. The European Monetary System comes into force and the Exchange Rate Mechanism (ERM) is set up with eight participating member states required to maintain their currencies within 2.25 percent fluctuation margins. The United Kingdom stays out. European Community heads of government meet at Maastricht, the Netherlands, and agree on the Treaty on European Union (Maastricht Treaty). It calls on the completion of European Monetary Union (EMU) and the introduction of a single currency, the ecu, by 1999 at the latest. The United Britain obtains the right to abstain from social legislation and a single currency. The name �euro� is selected at a European Council meeting in Madrid. The currency is to be introduced on 1 January 1999. The euro is adopted as the single currency of the European Monetary Union by 12 member states - Austria, Belgium, Finland, France, Germany, Greece, Ireland, Italy, Luxembourg, the Netherlands, Portugal and Spain. From that date the national currencies of those states become subdivisions of the euro. Greece joins a year later. The euro is the sole legal currency of the euro-zone. Member nations may accept national currency or euros until the end of February, after which all national currencies must be withdrawn from circulation. The seven euro banknotes depict the architectural styles of seven periods in Europe�s cultural history. Windows and gateways on the front of the banknotes symbolize the spirit of openness and cooperation in the European Union - while bridges on the back are a metaphor for communication among the people of Europe and those beyond. Robert Kalina, from the Austrian Central Bank and winner of a euro note design competition, designed the banknotes. The eight coins share a common design on one side - representing a map of the European Union against a background of transverse lines to which are attached the stars of the European flag. The other side features a national design. Luc Luycx, a computer scientist at the Belgian Royal Mint, won the competition to design the common face of the coins.